Although lavender theme of weddings is not new,newlyweds are increasingly choosing this color as a major on his triumph. This shade is universal: it is often used on-site activities and in the banquet hall, easy to combine with all the pastel shades or classic. A bouquet of fragrant lavender - either monovariant or composition with roses, carnations, orchids, peonies, freesia and hydrangea. Not surprisingly, the twigs of this plant aslike a bride - a flower is extraordinarily beautiful and has a unique flavor that is never boring. It is called a plant in Latin "lavare", which means "to clean." The ancient Egyptians used lavender for embalming and flower essential oil is an important element in international trade in the ancient world. There is a beautiful legend, in which the Virgin Marypresented an extraordinary lavender scent, awarding her that the little Jesus quickly dry clothes on her bush. Who is this flower is the hallmark of the French city of Provence where the lavender decorates every flowerbed. Also, the plant grows in large numbers in the Crimea, Krasnodar Territory, India, in the Canary Islands. Lavender is used in many areas of health and beauty: cooking, medicine, services. Newlyweds love this flower is used in the bride's bouquet for its beauty and versatility. Lavender - a symbol of consistency,nobility, purity and love. This Mercury flower - the winged god who is the intermediary between the gods and mortals. It is believed that this plant brings the newlyweds happiness. Many believe this will take, and therefore lavender flowers not only decorate the bride's attire, but guests often teaches his young as a gift. This flower is used in the bridal bouquet freshform, or dry lavender harmoniously combine with other plants. In any case, it looks nice and gently. Choice options bride bouquet of lavender should be addressed when the wedding dress has ordered him to perfect harmony with the bride dress. 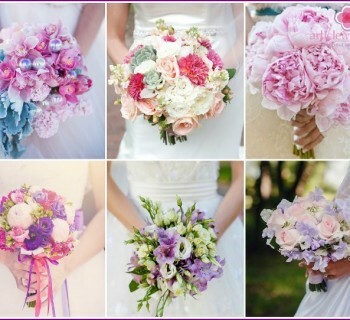 Shades of lavender perfectly with pale pink, white, red, blue, blue, violet tones. Also, the color blends with the pastel shades. All the flowers in a bouquet should be securely fastened to it in the course of the holiday does not fall apart from one awkward movement. You can not do cumbersome composition, the main thing for the bride at the wedding - it's easy. Bouquet should be suitable not only to the bride's wedding dress, but also combined with buttonhole Groom, which in this case it is better to do the same with a sprig of lavender. If you love luxury bouquets add to the delicate flowers of this plant aristocratic orchid juicy purple hue. An experienced florist will make this combination work of art. 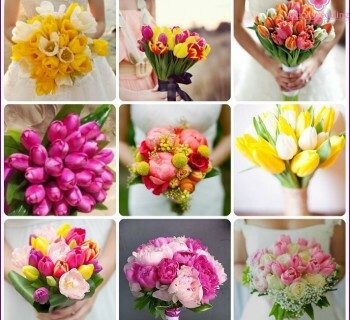 The height of the bouquet depends on the bride's growth. Tall girl can be purchased form the composition of the cascade, and the newlyweds small stature perfect bouquet-hemisphere. The sensitive and feminine make waybride's bouquet of lavender flowers and peonies. The latter occupy a leading place in the ranking of the most romantic of flowers. This combination will compete with classic roses and other popular flowers. Peonies with lilac lavender flowers look magnificent, delicate, compact, luxurious. Delicate petals of white peonies sparkle in the sun like silk. Rose any shade in a wedding bouquet looksgreat. 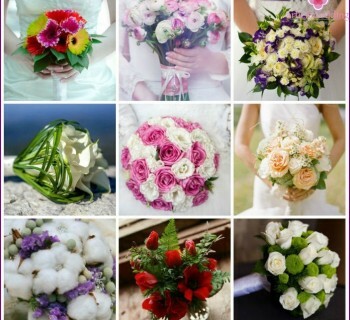 Florists used for the wedding day as a large rose buds on long stems and small bush types of flowers with tiny heads. Elegant looks in a combination composition for the bride orchid, lavender and roses. This bouquet will win any great range of colors perfectly complement each other. Lavender - the only universal flower,which will be in harmony with the above-mentioned any wedding style. Moreover, it is practical. After the triumph of her dry, tie the ribbon and put in a vase, where the bouquet will be for many years to delight you with its extraordinary tenderness. The photo below will help you make the right choice for a wedding.